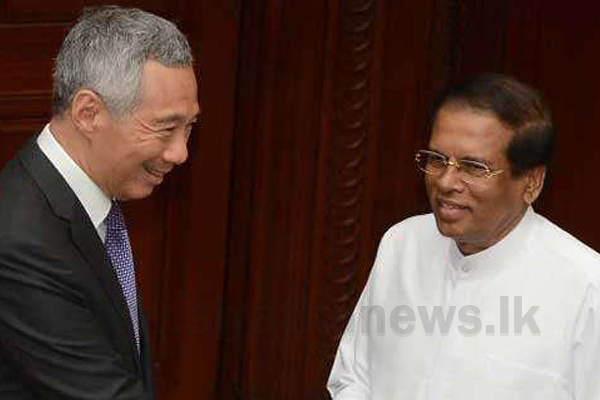 President Maithripala Sirisena who is on a two day official visit to Singapore held bilateral discussions with Prime Minister of Singapore Lee Hsien Loong today (25). The two leaders agreed to further strengthen trade, tourism, and industrial relations between the two countries during this meeting, the President’s Media Division said. President Sirisena, referring to the Free Trade Agreement (FTA) signed between Singapore and Sri Lanka, said that while drafting it certain weaknesses were evident from the Sri Lankan side and it is expected to make certain amendments. President Sirisena emphasized the importance of working towards that in the future, the PMD release said. He stated that President Sirisena has set a model to the world on environmental conservation. He was grateful for the suggestions made by the President Sirisena at the Forum today. Expressing his gratitude, Minister said that the proposals would be of internationally significance. The President appreciated the support given by the United Nations to Sri Lanka at the time of protecting environment and in the face of challenges that arise from climatic changes. The President briefed the Minister on the strict rules and regulations of the Sri Lankan government to protect the environment and the program of the Sri Lankan government for the preservation of the environment and the assistance of the armed forces for the protection of the environment.